Your favorite flying squirrel and dim-witted moose from Frostbite Falls, Minnesota! 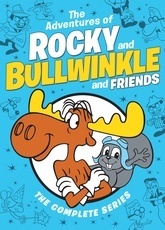 Premiering in 1959, the original series was comprised of 163 episodes featuring "Rocky & Bullwinkle," "Dudley Do-Right of the Mounties," "Aesop and Son," "Fractured Fairy Tales," "Peabody's Improbable History" and more. Starring Rocky, Bullwinkle, Boris, Natasha, Dudley Do-Right, Mr. Peabody and Sherman, this comprehensive collection includes every unforgettable adventure, insightful bonus features and an episode guide!